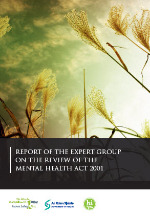 The Report of the Expert Group on the Review of the Mental Health Act 2001 was published on 5 March 2015. The press release is here. The full report is available here.